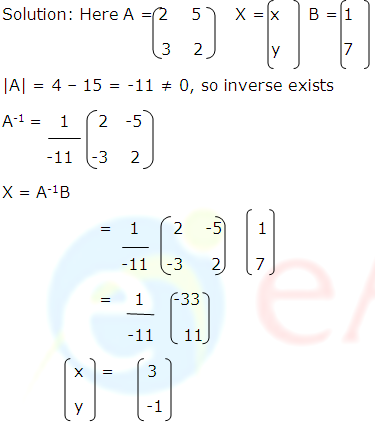 In this topic, we will discuss the applications of determinants and matrices for solving the system of linear equations in two or three variables and for checking the consistency of the system of linear equations. As in the previous case, take the coefficients of x, y and z as A unknown values as X and constants after equality sign as B. Example: The sum of three numbers is 6. If we multiply third number by 3 and add second number to it, we get 11. By adding first and third numbers, we get double of the second number. 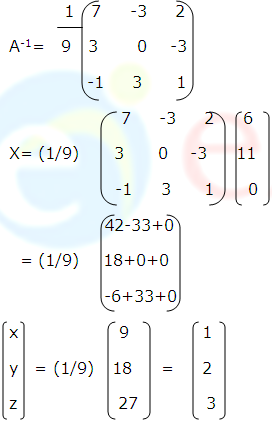 Represent it algebraically and find the numbers using matrix method. 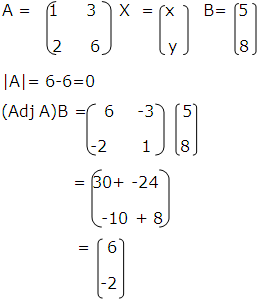 Solution: Let first, second and third numbers be x, y and z respectively. A system of equations is said to be consistent if its solution one or more exists. For example: The system of equations given above, 2x + 5y = 1 and 3x + 2y = 7 are consistent since they have unique solution. A system of equations is said to be inconsistent if its solution does not exist. • If (Adj A)B≠0, then the solution does not exists and the system of equations is said to be inconsistent. • If (Adj A)B ;=0, then the system may be either consistent or inconsistent according as the system have either infinitely many solutions or no solution. Since |A|≠0, the system is consistent and has unique solution. Since (Adj A) B ≠ 0, the system is inconsistent and has no solution.